If you're in the process of planning a visit to San Francisco, CA, one attraction that's popular with tourists and SF locals is Lands End. There is a short 1.5 mile hike (sections are handicap-accessible) that is part of the Coastal Trail, plus many places to explore like the Sutro Baths (ruins of an old bathhouse/swimming pool right in SF), and a memorial to the USS San Francisco. There is also a recently completed Visitor Center/Gift Shop/Cafe. Depending on what you want to do, this can take anywhere between 1 to 3 hours to fully visit. The main Visitor Center and Sutro Baths are located at the offical entrance at 680 Point Lobos Ave, San Francisco. So this is the best place to park when you don't plan on hiking the full 1.5 mile (one way) hike. If you plan on doing the short hike, you can opt to park at the other end of the trail, at approximately 922 El Camino Del Mar, San Francisco. Here, you will find street parking, which in my past experience has been easy to find. If you plan on doing the full 1.5 mile hike on the Coastal Trail, come prepared with a camera to capture many unobstructed shots of the Golden Gate Bridge. The Sutro Baths is literally the remains of an old bath house (swimming pool complex). Though the dilapidated concrete pool foundation still remains, not much else remains of the building. It is however uncommon to see ruins remain in SF. It's good for a few shots here and there, but don't expect much else. If you want a full meal, take a stroll down to Cliff House. Though I've never eatten there myself, I can observe that the restaurant is situated right off the cliff. I can only imagine the amazing views from inside the restaurant of the ocean. But if I were to recommend it, I'd say you should do the hike. It's mostly a dirt hike, but a small segment near the Visitors Center is paved. There are a few side trails that you should definitely explore that take you to lookout points. So there is a lot of see. Like on most hikes, I'd advise bringing water, but there are usually enough people around and cell phone coverage that it isn't a life threatening situation. There are no water fountains or bathrooms along the 1.5 mile route. Of Sutro Baths, Cliff House, and the Lands End Hike, I would recommend for tourists the Lands End Hike. 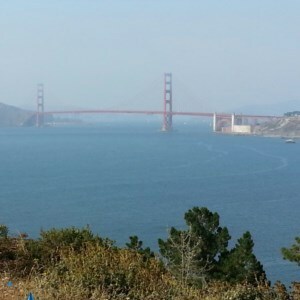 It's worth the memories and amazing pictures you'll get of the iconic Golden Gate Bridge.